The Mitchell & Ness x Canadiens exclusive collaboration brings a “street” look and feel to the traditional fan gear. 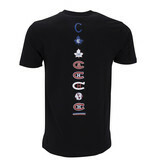 This collection brings a stylistic and fashionable twist where you will see a nostalgic call back to the history of the Canadiens by displaying the evolution of the Canadiens logo on some pieces. Some other items will show off the current logo slightly altered to bring that Mitchell & Ness vibe to it.